This is EDSA passing the bridge entering Guadalupe in Makati City. These are where most of the biggest billboards are placed. You can see a huge ad for Coke. 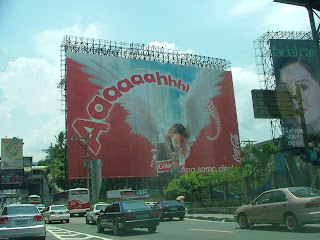 Compared to the one beside it, Kris Aquino's face covers a wider area than the angel in the Coke ad. My weird imagination was thinking that it would be creative if the bottle of coke had a straw and it would extend past the rectangle ad area towards the direction of Kris' mouth. I saw a similar ad (Visa I think) with Jacky Chan jumping out of the billboard. It's an instant double endorsement for Coke. Of course, I'm sure the facial care ad would be furious. The rainy season is nearing and I hope these billboards won't be causing any hazards to motorists like what happened sometime last year. I certainly wouldn't want Kris Aquino's nose to fall on top of my car.